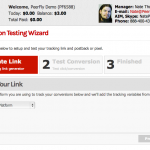 Along with a new design, the Conversion Test Wizard is now easier to use than ever. 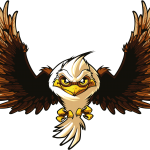 Instead of the old three step process, simply input the tracking link from your platform into the Wizard and hit submit. That said, there are still a few issues that would cause a lead not to fire correctly. 1. Are you using a landing page? The conversion tester can only fire a test lead to your tracking link. 2. Have you added the correct variables to your affiliate link? Did you append a sub ID variable onto your affiliate link before you entered it into your tracking software? With Prosper, enter ?s1=[[subid]] and for CVPLab, just append ?s1= to the end of your trkur link. 3. Have you set up postback? 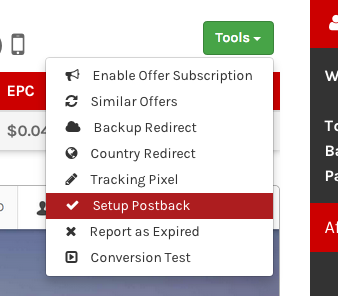 You can place both a tracking pixel and individual postback using the sub menu on the offer page. 4. Have you added our placeholder variables into your postback link? 5. Are your postbacks conflicting? Tracking pixel + individual postback = That’s fine, too. 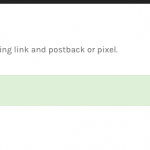 Tracking pixel + global postback = Fine again! Individual postback + global postback = Problem. While global postback should usurp individual, it doesn’t always work correctly and can cause major tracking issues. We recommend setting up global postback for this reason – plus, you only have to set it once! The last reason you may be unable to fire a test conversion is that you have cloaking on. It doesn’t cause issues when running offers, you would need to turn it off to send a test a lead. Don’t forget: Your Affiliate Manager can always a test lead for you! Just send over your tracking link and we’ll do the rest.